TOWER SITE CALENDAR 2007 - LAST CHANCE TO PREORDER AND SAVE!!! Schedule Note: Due to the Labor Day holiday, the next NERW will be Tuesday, September 5. *It's hard to think of a recent week's news that's been as dominated by a single broadcast company as last week was by Pennsylvania-based Entercom. In a pair of deals announced Monday morning, David Field's rapidly-growing broadcast group picked up four station clusters from CBS Radio for $262 million - and struck a $30 million deal to buy Boston's WILD-FM (97.7 Brockton) from Radio One. We'll assess the impact of both deals in this week's NERW, starting in MASSACHUSETTS, where the Radio One sale made for big headlines. From Entercom's side of the fence, it was a straightforward move to improve the coverage of its active rocker, WAAF (107.3 Westborough) into the core of the Boston market, where WAAF has struggled to be heard clearly for decades. Entercom wasted no time getting the WAAF signal on the new frequency - within a few hours of the announcement on Monday, WILD-FM's urban format was history, and by Tuesday WAAF was ID'ing with both frequencies. As Field noted in a conference call after the deals were announced, the addition of 97.7 to WAAF is extraordinarily cost-effective, requiring no new staff or expenses beyond the tower rent and power bill at WILD-FM's Great Blue Hill transmitter site. So WAAF now has a 97.7 signal that hits the city of Boston and the South Shore, along with the big 107.3 that covers west and north of Boston. It's good news for rock fans, but the listeners to WILD-FM's old format aren't celebrating. Radio One was the only black-owned broadcaster serving the Boston market, and in addition to pulling the plug on the urban "Wild 97.7" last week, the company also dumped the black-oriented talk programming it had been running on sister station WILD (1090 Boston), the city's heritage black-owned station. The daytime-only AM signal had been carrying a local morning show hosted by Jimmy Myers, followed by the national network programming that Radio One launched earlier this year on its stations around the country. As of last Monday, WILD(AM) has flipped to automated black gospel, augmented by the syndicated Tom Joyner morning show that had been heard on WILD-FM and a handful of leased-time talk shows left over from the previous AM talk format. Myers is out of work (though he was doing some fill-in later in the week on Greater Media's WTKK 96.9), and there's strong speculation that Radio One is looking to sell the AM as well. What's left for Boston's black community with the demise of the WILD signals? Clear Channel's WJMN (Jam'n 94.5) targets black listeners with its hip-hop heavy top 40 format, but there's a long-standing resentment in the black community about the station's ownership - and about its substantial suburban audience. Beyond WJMN, only a handful of specialty shows on college stations specifically target the black audience that makes up more than 5% of the market's population. NERW's take: Boston has always had a reputation as a tough town for black radio - it wasn't until the 1998 launch of WBOT, WILD-FM's predecessor, that the city had a full-time FM signal aimed at the black audience - and the demise of WILD-FM won't help that image at all. Unfortunately, WBOT/WILD-FM launched with several strikes against it. Until the station's transmitter moved to Great Blue Hill just last year, its signal in the heart of Boston's black community was mediocre, and even after the move, it suffered from a limited reach north and west of the city. What's more, Radio One never seemed fully comfortable as a Boston operator. The company's committment to local programming on WILD and WILD-FM was always minimal, and the stations never seemed to promote themselves as aggressively as the larger players in the market did. In other markets, Radio One pursued a cluster strategy that assembled several signals to offer a range of urban programming, but the high cost of entry in the Boston market made that impossible in the Hub. Given the stratospheric prices for recent station sales in Boston, it's hard to imagine other owners making a run at Boston's urban audience right away, sadly. It all depends on your continued support. If you're not a current subscriber - or if your subscription has lapsed - now's the time to fix that. Click right here to subscribe...and we'll gladly put you first on the list for the 2007 Tower Site Calendar (shipping in just a few weeks). If you have a job opening to fill, or a product to sell, and you want to reach everyone who's anyone in radio (and TV) in the northeastern US, we offer economical classified and display advertising. Just drop us a line or give us a phone call and we'll get you right up on the site. And if you're already a financial supporter of NERW, thank you for helping to keep an independent voice alive in the trade-publication wilderness! *A station sale in RHODE ISLAND: Chris DiPaola's Southern Rhode Island Public Broadcasting sells WKIV (88.1 Westerly) to EMF Broadcasting, which has been programming the station with its "K-Love" contemporary Christian format for the last year or so. The $100,000 sale comes on the heels of a power increase at WKIV, which goes from 100 w/66' AAT to 1.2 kW/122' AAT at a new transmitter site. Hall Communications' WCTK (98.1 New Bedford MA) is getting a new PD. Steve Giutarri will arrive in Providence from his current post at WYGY (96.5) in Cincinnati next month; he replaces PD/morning host Tad Lemire, who's heading to New Zealand with the goal of traveling around the world. IS YOUR AM STATION NRSC COMPLIANT? Not done in years? No available spectrum analyzer? Splatter monitor unreliable? Have it done with a spectrum analyzer as the FCC intended. Contact: BobRadil@comcast.net for details . *A NEW YORK morning show is no more. Buckley's WOR (710 New York) abruptly pulled the plug on Ed Walsh after his Friday broadcast. Walsh, who replaced John A. Gambling in 2000 when WOR ended the "Rambling With Gambling" franchise after seven decades, is being replaced beginning this morning with WOR weekend host Joe Bartlett, who'll host mornings alongside Donna Hanover. WHTZ (100.3 Newark NJ) has filled the high-profile vacancy created when Cubby Bryant moved over to sister station WKTU to become Whoopi Goldberg's morning sidekick. J.J. Kincaid will move to Z100 from Clear Channel's Dallas "Kiss" (KHKS 106.1 Denton) to take over afternoons, effective September 12. When Air America moves from WLIB (1190 New York) to WWRL (1600 New York) at the end of this week, WLIB will flip to black gospel. Owner Inner City Broadcasting has already pulled the plug on most of WLIB's non-Air America programming, including Imhotep Gary Byrd's overnight talk show; 1190 has been carrying a simulcast of sister station WBLS (107.5) in those timeslots for now. And what of WWRL's midday leased-time lineup? We hear most of it will move down the dial to WVNJ (1160 Oakland NJ), which already mixes lots of leased time with its nominal standards format. WRCR (1300 Spring Valley) has long been pushing for a better full-time signal than its present 500 watts day/83 watts night, and now the station has persuaded the FCC to give it a shot at a new home on the expanded AM band. While the Commission has been reluctant to take any actions on the "X-band" since its initial round of licenses more than a decade ago, it has opened a window for applications for a new signal on 1700 in Rockland County. To avoid automatically handing the new license to WRCR owner Alexander Broadcasting, the window is open to any applicant - as long as its facility will cover at least 50% of residents in the emergency zone around Rockland County's Indian Point nuclear power plant. WRCR argued that residents in the area currently have no local source for emergency information if there's a problem at the plant. Over at Westwood One, they're mourning Dino Tortu, who was killed in a bicycle/truck crash while on vacation in Maine August 16. Tortu, 52, was Westwood One's senior VP of production, with a long resume that included stints at ABC Radio Networks and the old Sony Westwood Radio Network. Long Island's WBAB (102.3 Babylon) has a new PD - Chris Lloyd arrives next month from WBSX (97.9 Hazleton) in the Wilkes-Barre/Scranton market, where he's currently OD. In Rochester, the week's big news was Entercom, of course - the $262 million deal that moves CBS Radio's stations in Austin, Cincinnati, Memphis and Rochester under the Entercom umbrella. Cincinnati and Austin are new markets for Entercom, and in Memphis the combination of the CBS and Entercom stations remains under the ownership caps. But in Rochester, the pairing of Entercom's four signals (country WBEE 92.5, adult hits WFKL 93.3 Fairport, classic hits WBZA 98.9 and talk WROC 950) and CBS Radio's four signals (modern rock WZNE 94.1 Brighton, classic rock WCMF 96.5, top 40 WPXY 97.9 and AC WRMM 101.3) will put Entercom significantly over the cap. What is that cap, exactly? The revised ownership rules the FCC adopted a few years back now define it by Arbitron markets rather than by signal overlap, and our analysis puts the Rochester market in the "45 stations or more" category (since noncommercial signals are included in the count), thus allowing Entercom to own up to eight stations, of which no more than five can be in the same band. In theory, then, Entercom should be allowed to keep WROC and five of the seven FMs - most likely the five class B signals, which includes everything except WFKL and WZNE. That, however, assumes that the deal meets Justice Department approval as well, and with the dominance that a cluster including WBEE, WCMF, WPXY, WBZA and WRMM would have in the market, it's still possible that one of the big class B signals could end up being spun off before the dealing's done. (A bit of "only in NERW" trivia - if WPXY remains in the Entercom family when the wheels stop spinning, it would achieve the rare distinction of having been part of all three big clusters in town, having first been part of the Lincoln Group, which became the core of today's Clear Channel Rochester cluster, before being dealt to ARS, which was absorbed into Infinity and then CBS Radio. A Watertown broadcaster who rose to national prominence died last week. Tony Malara began his career at Syracuse University's WAER (88.3), then worked at Watertown's WWNY-TV (Channel 7), eventually becoming the station's general manager before moving up to network management at CBS. Malara served as CBS TV's head of affiliate relations, then as the network's president, before his retirement in 1995. Most recently, he had moved into television ownership - his Malara Broadcasting bought stations in Fort Wayne, Indiana and Duluth, Minnesota from Granite in 2004, entering into shared-services agreements under which Granite operates the stations as quasi-duopolies. Malara also served as president of the New York State Broadcasters' Association in 1978-79. Malara died Thursday in Syracuse of complications from leukemia, followed by a heart attack; he was 69. Also in Syracuse, Citadel's WNTQ (93.1) is moving its lineup around. Rick Roberts moves from evenings to afternoons, adding the music director job to his business card. Big Jim Donovan moves from afternoons to middays. Meanwhile at Pamal, former WFLY (92.3 Troy) morning co-host Brian Cody returns to morning drive Sept. 12. He'll be on the air with Chrissy Cavotta (formerly of "Frank" in Portland, Maine) and Jim Clark (late of Metro Traffic). *In eastern PENNSYLVANIA, there was little surprise when Clear Channel finally unveiled the new format on WSNI (104.5 Philadelphia) at noon on Wednesday, after more than a week of stunting. In place of the soft AC "Sunny" format that had been on WSNI, it's now Spanish tropical "Rumba 104.5," the city's first-ever full-market Spanish FM station. While the Philadelphia market's Hispanic population is much smaller than other big Northeast markets, Clear Channel says it's growing quickly, and worthy of its own signal. Philadelphia has a new AM signal, too - Alex Langer completed the move-in of WFYL (1530 McConnellsburg) to its new home on 1180 in King of Prussia, and the station made its official Philly-market debut on Tuesday. It's a 420-watt daytimer operating from a short Valcom tower in the middle of a golf course in West Norriton; it's mostly carrying talk from Langer's National Radio Network for the moment. In Allentown, the oldies will soon be history at Clear Channel's WKAP (1470); it will flip to religion as WYHM beginning Sept. 11, though it will continue to carry Phillies baseball, at least for the rest of the season. Radio People on the Move: Kannon departs the afternoon slot at WRDW (96.5 Philadelphia), heading for afternoons at Clear Channel "Kiss" WKSC (103.5 Chicago). Dipti "Dee" Patel has been promoted from editor to news director at KYW (1060 Philadelphia). In Harrisburg, WCAT-FM (102.3 Carlisle) APD/music director Don Brake is leaving for an as-yet-undisclosed new gig within the Citadel family, so the station's looking for a replacement. On TV in Harrisburg, Matt Uhl has exited as GM of Clear Channel CBS affiliate WHP-TV (Channel 21). Anchor Kirsten Page has also left the station. And in Pittsburgh, CBS Radio's WRKZ (93.7 Pittsburgh) will be picking up the "Kidd Chris" show from sister station WYSP (94.1 Philadelphia), beginning this afternoon. *Just one note from CANADA - CFCY (630 Charlottetown) is now testing its new FM signal on 95.1. Once CFCY makes its move to FM, expected later this fall, Prince Edward Island will become the first Canadian province with no full-power AM signals at all. Will it be the only one for long? Your editor doesn't normally see two of his former colleagues at WBZ making news on the same day, but it's an unusual Monday. Over at WBZ itself, Jay McQuaide is departing at week's end to join Blue Cross/Blue Shield, reports AllAccess.com. Jay got his start in the business at WLLH in Lowell (opposite yours truly at WCAP), and after a detour to Orlando's WDBO (580), he landed at WBZ in 1992 as midday anchor and designated fill-in for morning man Gary LaPierre. And the guy who hired Jay (and your editor) at WBZ is returning to the Boston radio scene. Brian Whittemore left the PD/ND chair at WBZ in 1996 to go to KDKA in Pittsburgh and then WCCO in Minneapolis as GM. He's been out of the WCCO job for a couple of years, but now he's headed to WRKO to fill the operations manager post left vacant by Mike Elder's move to Fox News Radio. Welcome back, boss! *It's been not much more than a year since WPEN (950 Philadelphia) dropped its long-running standards format and flipped to oldies, challenging the market's oldies leader, Infinity's WOGL (98.1), with a jock lineup that included familiar Philly voices like Jerry "Geator" Blavat, Jim Nettleton and Christy Springfield. On October 3, WPEN will drop the oldies and become PENNSYLVANIA's newest sports station, going up against the dominance of Infinity's WIP (610) with a lineup that will include Jim Rome in middays, former WIP (and WFAN) host Jody McDonald in afternoons and Sporting News Radio's Tony Bruno (who got his start at WIP) in late mornings. There's a new signal on the air in CONNECTICUT, and even though it's just a watt, we'd bet plenty of people can tune in W220CE (91.9 Southington). That's because the new WMNR (88.1 Monroe) translator sits high atop West Peak in Meriden, shoulder-to-shoulder (well, bay-to-bay) with most of the big FM signals in Hartford and vicinity. The final days of talk on NEW YORK's WEVD (1050 New York) are apparently upon us, and so is another protest from Chuck Zlatkin's "Save WEVD" group. This time, they're planning a candlelight vigil outside WEVD's studios at 333 Seventh Avenue, to begin at 9:30 PM on Friday (August 31) and end with the candles being snuffed out at midnight, when 1050 will reportedly become ESPN Radio under ABC management. On the TV side, we hear October 1 will be the debut of Univision's second network, to be known as "Telefutura." WHSE (Channel 68) in Newark, N.J., WHSI (Channel 67) in Smithtown, WHSP (Channel 65) in Vineland, N.J. and WHUB-TV (Channel 66) in Marlborough, Mass. will be the initial affiliates in NERW-land; we'd expect some call changes down the road. We'll start this week's news from CANADA with word that CBC's Radio Two service will soon be available in Quebec City. As part of the CRTC's mandate to broaden the reach of CBC/Radio-Canada services, the CBC won permission this week to put a new CBM-FM (93.5 Montreal) relay on the air in Quebec City. The new signal, with 308 watts, will be at 96.1, the former home of noncomm CKIA ("Radio Basse-Ville"), which is moving (or perhaps has already moved) to 88.3. After more than three years of bitter head-to-head competition for Boston's country-music audience, the war between WBCS (96.9) and WKLB-FM (105.7) came to an end late Friday night. WKLB-FM jock Greg Williams closed out the evening with several appropriate songs, winding down with the lyric "It was over, just like that," and the brief comment, "Ain't that the truth...WKLB-FM Framingham Boston." And after a few seconds of dead air, 105.7 slid into a simulcast with WBCS that's expected to continue for about two weeks. The former WBCS air talent remained on the air Saturday, giving dual IDs as "Boston's Country Stations, WBCS 96.9 and WKLB 105.7." We'll know Monday morning whether WKLB's top air talent, morning hosts Loren and Wally, will be part of this interim simulcast format. Police on Cape Cod have made an arrest in the sabotage on WWKJ (101.1 Mashpee) and WJCO (93.5 Harwich Port). A 15 year old boy from Centreville MA was in juvenile court on Friday, charged with cutting the cables from the stations' satellite dish. Station officials say the cable-cutting also damaged one of the receivers, leaving WJCO (soft AC "Coast 93.5") off the air for almost two days. It appears the boy may have been upset about the stations' format change from modern rock, and that he may have had adult help. Out in Western Massachusetts, a distinctive FM station may be in for some big changes. Radio Skutnik, Inc. is selling its Greenfield MA properties, WRSI 95.3 and WGAM 1520, to Watertown Radio Associates of Claremont NH. Watertown's ownership is cross-linked to Northstar Broadcasting, which owns WTSV-WHDQ Claremont NH, WNHV-WKXE White River Junction VT, WSSH Marlboro VT, and WXPS and WCPV in the Burlington VT market. I believe they also now have an interest in WZSH Bellows Falls VT, which along with WSSH serves the Brattleboro VT area, just to the north of Greenfield. Will Watertown be willing to spend $650,000 and keep WRSI's distinctive AAA format? Time will tell, but it doesn't look good. Skutnik has an option to repurchase WGAM, a 10kw DA daytimer, for $70,000. WGAM currently programs a satellite standards format. You can sponsor this new weekly feature! Click here for information! *It's here! Tower Site 2007 is now at the printer, and we'll begin shipping it out just after Labor Day. This year's edition features what we think are the finest tower images yet - from the cover image of WCCO Minneapolis all the way to the back-cover centerfold of WBZ in Boston, and from KGO San Francisco to KOIL Omaha to Philadelphia's famed Roxborough tower farm, captured in a dramatic dusk shot with the lights all aglow. This sixth annual edition once again contains plenty of historic dates from radio and television history in the Northeast and beyond, and as always, it comes to you shrink-wrapped and shipped first class mail for safe arrival. Why place your order early this year? Two reasons - first, we're printing a more limited quantity of calendars this year than in past years, and we do expect the 2007 calendar to sell out before long. And second, if you order before September 1, you can order your 2007 calendar at the same $16 price that we've been offering ever since the 2003 edition. After that, because of increases in production and postage costs, we'll be forced to raise the price slightly...so don't wait! You can even get your 2007 calendar free with your new or renewal subscription to NERW at the $60 level. 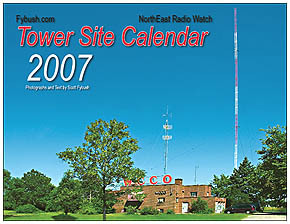 Visit the Fybush.com Store and place your order today - and be among the first to get the Tower Site Calendar 2007, just as soon as it rolls off the presses in a few short weeks! NorthEast Radio Watch is made possible by the generous contributions of our regular readers. If you enjoy NERW, please click here to learn how you can help make continued publication possible. NERW is copyright 2006 by Scott Fybush.